Aquaponic setups are nearly identical to hydroponics, the main difference being the source of the nutrients for the plants. Nutrients are no longer added to a water tank–instead, they are produced by waste produced by the fish. 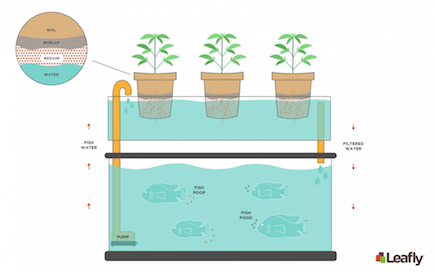 The diluted fish waste is pumped out and delivered to the roots of the plants. The roots absorb the nutrients and purify the water before it is returned to the aquarium. Fish food is the only input you’ll need, and this can be grown or purchased for the system.